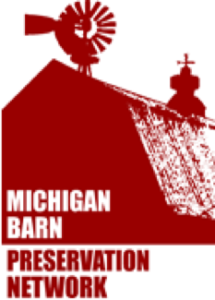 The Barn of the Year program annually honors existing Michigan barns that exemplify outstanding character in our state. Over the past two decades, a total of 74 barns from across Michigan have been recognized for their unique qualities and/or preservation efforts. Nominated barns are judged on (1) completeness of information presented in the application, (2) sensitivity and integrity of repairs or modifications, (3) visual appeal, (4) creativity, (5) thoroughness of work and (6) effort expended to repair and maintain. To be eligible, the barn must have been built before 1957 and be in-use, either for continued agricultural use or adapted for other uses. Barns must retain their overall appearance-both interior and exterior barn characteristics. The nomination form will be available when the next submission period starts in early 2020. For further information, contact the awards program chairman, Keith Anderson. E-mail: klanderson42@gmail.com or Mobile: 616-540-6701. 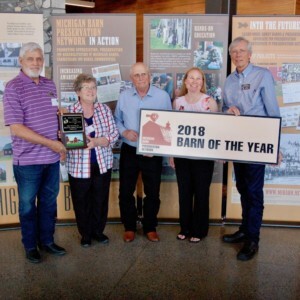 You can see 2018 photos and winning barn information here.